Hi everyone. I tried posting this a while back but i'm having trouble with the forum. I'm not even sure this will work as when i try to type in the box the letters are appearing on the far right of the box. This is 9.5 hrs of rgb 120 and 60 second subs with the Tak Epsilon 130 and Asi 071. 11 hrs of 60 second subs with a William Optics star 71 and Asi 1600. A real mixture of conditions for this over multiple nights. 'Liked' this one long time ago on Flickr. It is a lovely sharp image and just something about the flame nebula here that I really like. Well done! Yes. That is an utterly amazing image. The detail of the Flame Nebula is stunning to behold. 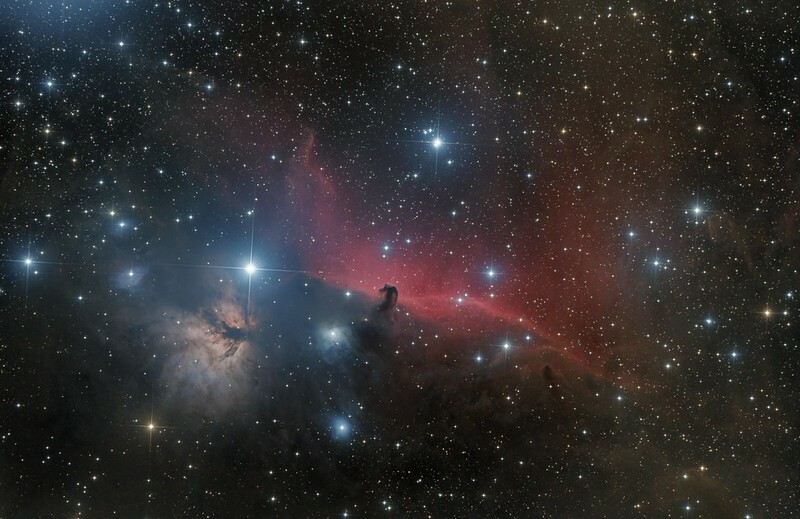 I also greatly admire the dark shapes below the right hand side of the Horsehead Nebula. Also the stars are exceedingly well focused.